My name is Maria Alfaro. I was born in Rome, Italy and came to the United States with my parents in the early 70's. I have been an animal lover my whole life, beginning with my first cat. Currently, my wonderful husband and I share our home with a tabby cat named Tigger, and a miniature Australian Shepherd named Coco. 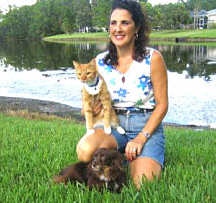 My career as a professional pet sitter began in 2001 caring for a few neighbors' pets when they went out of town. I now have many clients all around Northern Pinellas and am always welcoming new friends into my daily rounds. Are you ready to make the change to a professional pet sitter service instead of kenneling your pets each time you are away from home? See the advantages of having professional pet sitter care in your home.